And like that, we've reached Mordor. 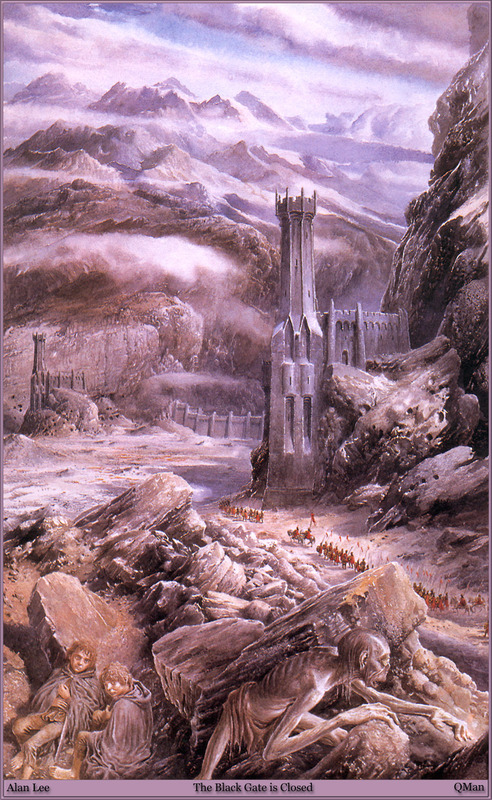 Of course, Mordor isn't just Mount Doom or a fortress, it's a country boxed in by three mountain ranges. Not only that, but the only feasible fronts from which to attack for our various friends and allies all benefit from nearly impassible mountains and well fortified passes. While it is true that Sam and Frodo never asked about other ways into Mordor, I can't help but wonder at cunning deliberation on the part of Gollum or if it truly was a later thought as he began to plot how to separate Frodo from the Ring. They believe his urgent warnings of threat and danger, but I don't know if they would have trusted his offering of a secret way into Mordor. In the face of the impossibility of the gates, his other way in sounds at least necessary, if still fraught with peril. This occurs as Gandalf and Sauron are facing off in Isengard and the Palantir is thrown out of the tower... except we get it in the film probably about an two hours of watching time earlier (Scene 15 out of 53... vs several scenes into the next movie) and before the Battle of Helms Deep. The grandeur of Mordor (or at least it's fortifications) is well displayed. The scale of the gate, even in our modern era, is staggering. Sam & Frodo's near miss is a bit of suspenseful comic relief that doesn't add anything but doesn't really take away from anything either. Andy Serkis and Sean Astin nail this scene, though credit where credit is due, we get more out of Frodo than we have in awhile. Dialog is minimal, snippets pulled from the text and bits to build the tensions surrounding Gollum's role in this adventure. Repeatedly, the conflicts between Sam and Gollum make for incredibly strong and engaging scenes, like when they disagree over the way to prepare meat. A bit of sass, snark, dislike, and great on-screen (antagonistic) chemistry build some great scenes throughout. Interestingly we haven't gotten to overhear Gollum/Smeagol arguing over their course of action at this point. Instead of Samwise overhearing the argument and references to "her" before they get to the Gates and learn of a second way, we get it after. The argument he has with himself is really fantastic and ultimately tragic for all it's comedic flavoring.